Monument Valley. Uploaded by beforethecoffee. Click on pic, see it in Flickr. What a serene shot this is. Have I told you I love twilight...the blue hour...or whatever you want to call it? GOTTA SEE IT IN LARGE ON BLACK. I've never been to Monument Valley, but now it feels like I have. You may recall that another Thriller came from Monument Valley...here it is reaching back to April 25, 2007 HDR Thriller (valley). Which do you prefer? HDR. Originally uploaded by kishore_maringanti. Click on pic, see it in Flickr. Hmmm...I don't think this is the type of halo around the moon that can forecast anything...other than better HDR images are in his future...they just gotta be. 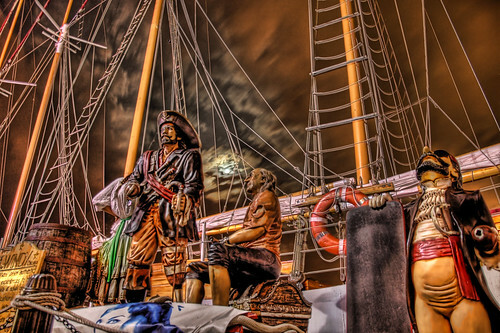 Pirates of Chicago, originally uploaded by Stuck in Customs. Click on pic, see it in Flickr. Saw Pirates of the Carribean over the weekend, and thought it quite good; better than the last one. And so I thought it might make a fun search "as it were"....and it led me to this gem above (I'll stop). Definitely an arrghmazing shot here that really must be seen MUST BE SEEN IN LARGE ON BLACK. And as a runner up, here's a bonus that is even more pertinent to Capt. Jack Sparrow. And while it was a technically fantastic shot, how could I possibly bring myself to select a Thriller that was taken at Disneyworld?... (no offense intended to Walt and Mickey). Interesting though that there were 104,321 shots of Disneyworld on Flickr (not making this up) and only 98 of them were in HDR (really). Flickr is down for a few hours tonight, so in place of my usual selection from a search of Flickr, I thought I'd forego that, and post an old pic of my own that I had lying around. Here it is IN LARGE. Stuttgart Solitude. Originally uploaded by мѕс (мsc_pњτо). Click on pic, see it in Flickr. except for the sound of Jacob Marley's chain! If you do give a listen, be prepared for it to roll around in your head a while. Hochofen 5 (HDR), originally uploaded by Ozan™. Click on pic, see it in Flickr. 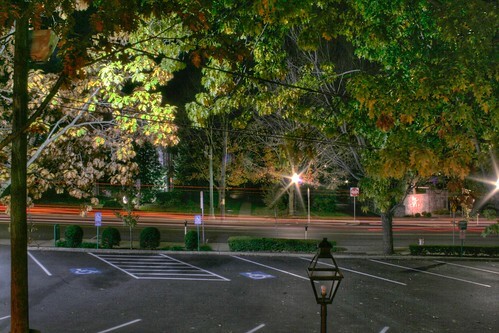 Strangely and unexpectedly beautiful, HDR brings out minute details, even at night. Should be seen in large on black. Night HDR, originally uploaded by Ben Ross. Click on pic, see it in Flickr. Sometimes a shot is posted to Flickr that begs questions. This one begs answers, like to WTF? Come with Us... Originally uploaded by CarlosBravo. Click on pic, see it in Flickr. Wow. This shot intrigues. LOOK IN LARGE ON BLACK FIRST. 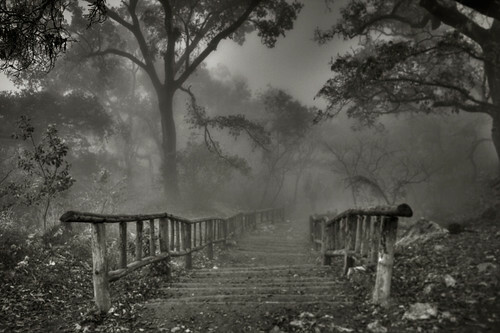 It is a shot with a mood, and although there is nothing obviously threatening in it, it does seem unnerving somehow. But then, as you look longer you will eventually see them. The zombies...deep in the mist....are coming. I really like the fact that they are almost subliminal at first. Allucinations. Originally uploaded by valpopando. Click on pic, see it in Flickr. Two Thrillers again today....and what a memorable subject for this one! HDR techniques make it possible to bring out the details in the distance givingthe shot a sort of 3D quality. See it IN LARGE. Very nice pic that gently throws whispers at those fear strings in one's psyche. ... farewell for now ... Originally uploaded by Kris Kros. Click on pic, see it in Flickr. I didn't anticipate something like this with the search word "scream", but that made it all the more fun. What a great moment captured, and boy, can I relate. 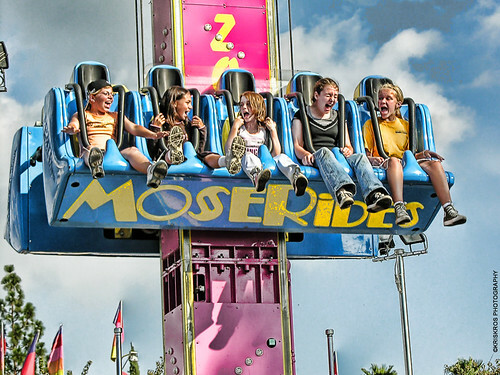 There are two kinds of people in this world...those that smile on this sort of ride and those that scream in terror. I know that I'm the latter type. 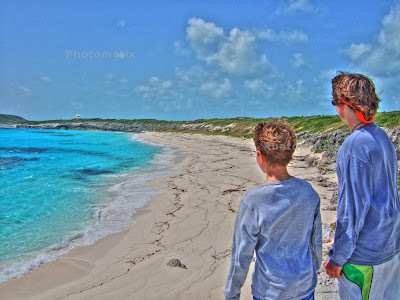 The HDR draws you in by making this look like an artists illustration, but its 100 percent photo. To really see their expressions YOU GOTTA SEE IT IN LARGE. The Scream, originally uploaded by Pisco Bandito. Not that I anticipated something like this either. "The Scream"?..I think Edvard Munch would be proud. And interestingly, Pisco does say in his Flickr caption that it was inspired by aliens. I think it's probably more accurate to say it was inspired by Alien. Aurorus Reflectus Colosseo, originally uploaded by Stuck in Customs. Click on pic, see it in Flickr. Man oh man, I could stare at this one for hours. I might have known another Stuck in Customs classic would come up. AN ABSOLUTE MUST SEE IN LARGE ON BLACK. I love twilight (and Maxfield Parrish paintings of it) and this has that kind of sky. This is a really senational moment captured here. Of course, the reflection on the sidewalk is an extra mesmerizing bonus. It's one of those rare shots that just adds something to your personal perspective on vision and perception. And the sense of history across two millenia here is tasteable--sad really because who could ever sack such a thing! 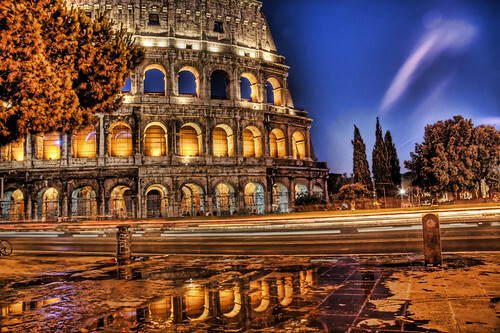 Put Rome on my list of must go places. P.S. - If you look at the large version again, you'll see an interesting HDR study in that that someone needs to replace a bulb on one of the the third floor archways and how the HDR processing handles the lack of light in that arch, and the sky beyond, as compared to the other lit arches. Valpoclassic! Originally uploaded by valpopando. Click on pic, see it in Flickr. This is another great shot that came up with this search word that was a virtual dead heat with the Stuck in Customs Coliseum pic such that I felt compelled to post it as a second Thriller today (and leave off the Chiller). And it just so happens it is also from Italy. 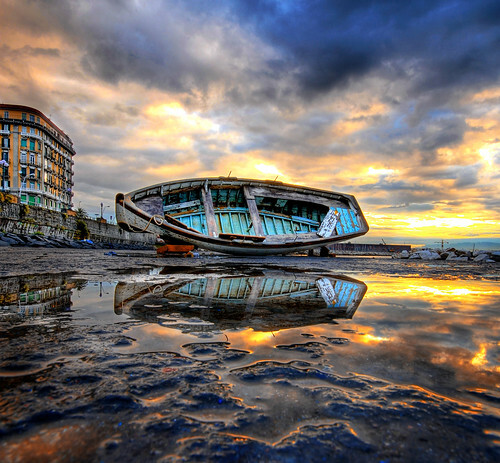 What great colors in the sky and boat, seemingly matched in the building. The fact that the boat is "perched" on rock rather than embedded in sand gives the picture something important to the overall impression...potential for movement maybe(?). Of course, its all even better IN LARGE ON BLACK. View from the Cabin, originally uploaded by dbsteers. Click on pic, see it in Flickr. Estupendo! A MUST SEE IN LARGE ON BLACK, where it braces you like a strong cup of java. HDR makes this shot possible by synthesizing the proper exposure everywhere in the pic...foreground and background. This just can't happen with conventional photography, and its why HDR mimics human vision and seemingly transports you to the place. The enhanced detailed swirls of ice in the glacier way in the background that show up in the large version exemplify the amazing depth in this shot. St. Thomas, Strasbourg, originally uploaded by dadita_1603. Click on pic, see it in Flickr. Another well done, but creepy pic. Quite the piece of wall art. 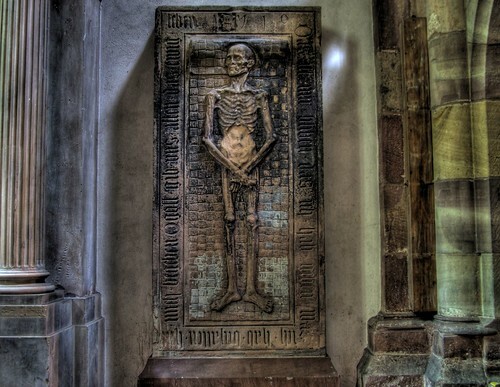 I think the title refers to the Church where this is found. The pic is actually quite good technically, but for something totally creepy here it is IN LARGE ON BLACK. Venice - Venècia, originally uploaded by Mor (bcnbits). Click on pic, see it in Flickr. Saw this during yesterdays search for "sunset" and thought it very worthy of reprising "sunset" as the search word today. 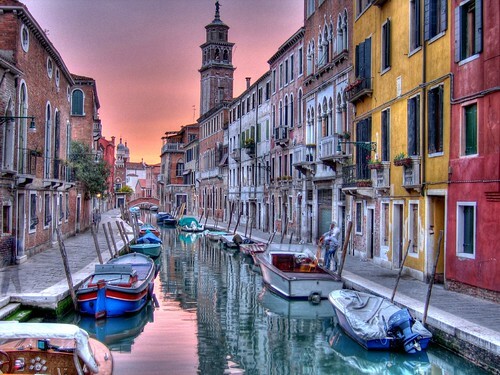 Between the architecture, colors, boats, and water, Venice really lends itself to HDR photography. And it also happens to be on the "must go" list just like yesterday's selection. A classic example of how great HDRs look like great paintings. Really must be seen IN LARGE ON BLACK. The End, originally uploaded by iJohn. Click on pic, see it in Flickr. This picture is a MUST SEE IN LARGE. 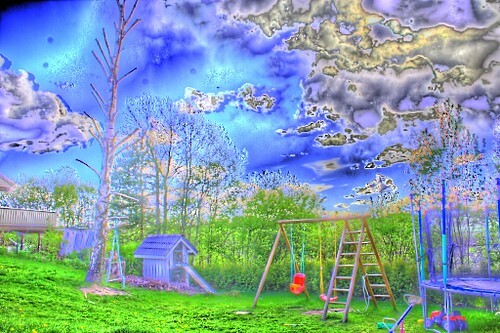 Definitely an example of the depth in 3 dimensions that HDR can offer. And this one really soothes too. 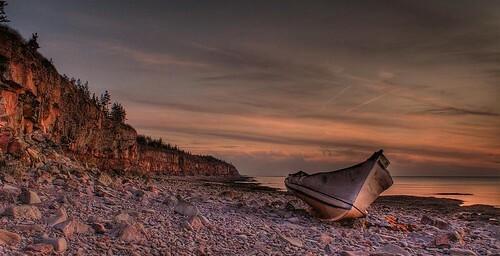 It's dusk on the Bay of Fundy which is on my "must go" list of places (yes, along with Iceland for anyone who has read this blog before). I do really want to see a 30-40 foot tide. Being an eyewitness to that must give you a true sense of "planet" by seeing the effect of incredible, yet invisible, forces outside of this planet molding things here (in this case, lunar gravity). Oh, and I'm giving the Chiller a rest today. Morning Garden, originally uploaded by Stuck in Customs. Click on pic, see it in Flickr. Continuing on the flower kick today, I chose "garden" as the search word and out popped over another Stuck in Customs beauty. This has that dusky twilight calmness to it. 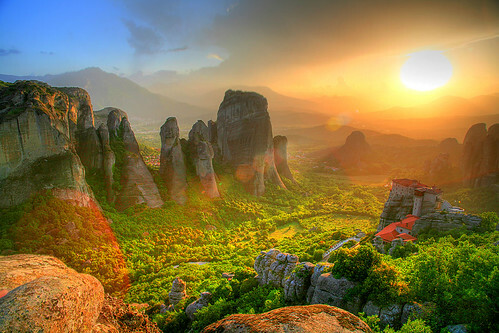 Truly sublime, aside from the fact that its hard to believe its a photo. That's the moon in the upper right. The whole thing should be seen IN LARGE ON BLACK. From my garden, originally uploaded by mandus. Click on pic, see it in Flickr. This made me chuckle because I keep thinking about the point in the HDR processing just before this version and the guy says to himself..."The purple's good, but it needs more saturation." I think it's gotta be the same guy who made the PJ in the frat house at college. After a shower, originally uploaded by Stuck in Customs. Click on pic, see it in Flickr. You HAVE TO SEE THIS IN LARGE to fully appreciate it. My sister in the hospital is surrounded by beautiful flowers. At home she has a small watergarden and I think her favorite is the iris. 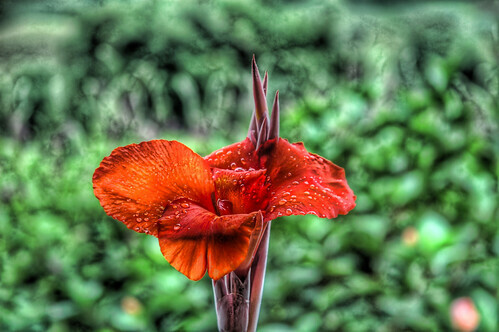 This one may or may not be an iris, but it is a good example of what can be done with flowers in HDR, but flowers are tricky. A lot of flower HDR shots (and believe me, I've looked at a lot) are nothing so different than a regular shot...like this one. It seems to me that HDR's benefits are much more obvious for subjects at long focal lengths because it can perfect the exposure of many more objects that are simultaneously in focus. 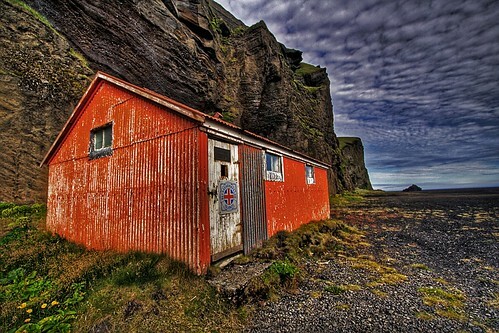 However, as the picture above shows, when done well, HDR techniques can subtly enhance detail in a unique way in macro shots too. It has also transformed the background here into something different. In lieu of a Chiller today, I thought I'd treat you to some more flower HDRs I think are excellent...Three's a Crowd, LadySlippers, Rainbow Buds, Shrubbery of Ni, and Yellow Flow. Most are from HDR photographer extraordinaire Stuck in Customs. He definitely has the knack. Fifth and Morrell 01. 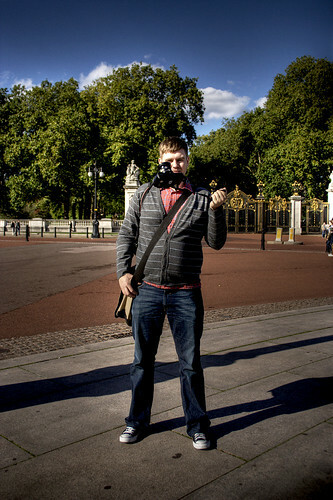 Originally uploaded by weinheimerphoto. Click on pic see it in Flickr. At first I was skeptical that was a real bug on top of the building, but a look at this in large convinced me that this truly is a giant carpenter ant. 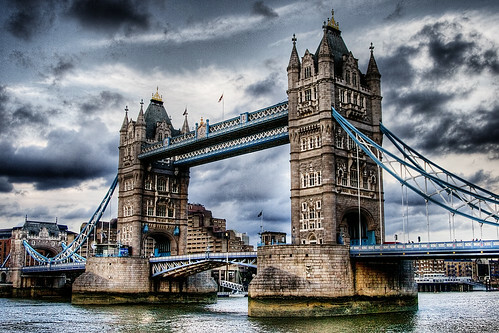 Tower Bridge, originally uploaded by Simon Crubellier. Click on pic see it in Flickr. Nice Tower Bridge pic and excellent sky. Should obviously be seen IN LARGE. It's a great shot and all, but still a bit anticlimatic when compared to yesterday's high point. If you missed yesterday, you need to scroll down and see it. scrabo tower HDR, originally uploaded by FujiBlonde. Click on pic, see it in Flickr. Just a hunch, but I don't think Scrabo Tower really looks like this. 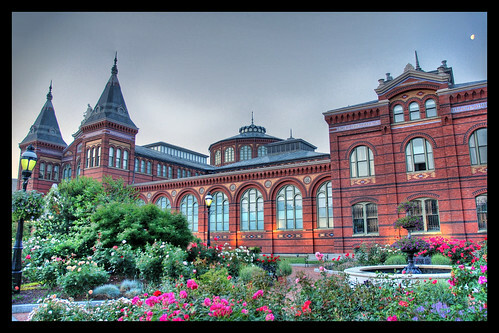 HDR photos done right can sort of mimic human vision in that they are provided higher exposure range throughout the visual field, but it definitely should not make you feel like you just consumed pure psilocybin. I realized I've seen this heavy handed approach to HDR before from FujiBlonde...case in point was March 7, 2007...she must not see things the same way I do. Let's talk it out over pizza...betcha she has mushrooms on hers. Μετέωρα, originally uploaded by ksengog. Click on pic, see it in Flickr. Wow. This is not an animation. When I saw this, my jaw dropped and I heard Gregorian chants in the background (and yes, here are even monasteries in the shot!) I might as well just fold up the tent and stop this blog right now. It's hard to imagine topping this one. GOTTA SEE IT IN LARGE! Jamestown Apartments, originally uploaded by PDPhotography. Click on pic, see it in Flickr. 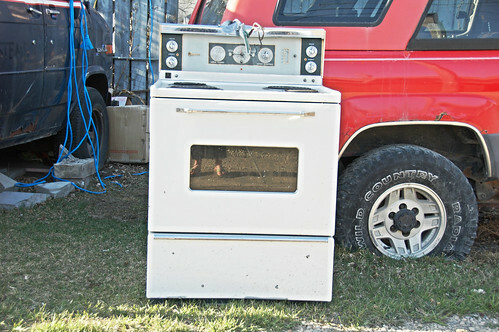 What is up with this seeming trend of people HDRing their Ebay auctions? TotC to Kelly Cho over at Catch a Falling Star, who has put me on the blogosphere map with a nice post about HDR and Hidyn Gems. Thanks, Kelly! Well, the cool thing about this to readers of Hidyn Gems is that Kelly's post went one step further by adding some links to HDR technique tutorials (you'll have to see them over there). Judging from some "how to" type questions on my blogcatalog page, many of you will want to check out her HDR article. Regardless of your interest in the tutorials, she has a great blog that you'll want to visit. 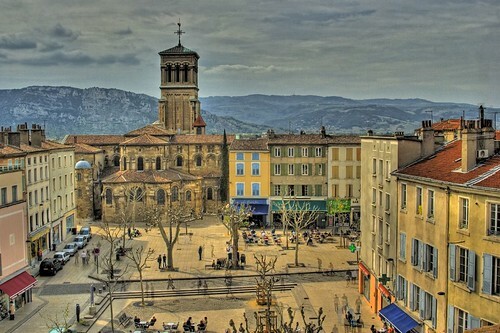 Place des clercs - Dolce vita à la française, originally uploaded by coolmonfrere. Click on pic, see it in Flickr. Well composed with the look of an old antique postcard. Recommended for viewing IN LARGE ON BLACK. The HDR technique makes ghosts out of some of the moving people in the courtyard, but it kinda works in this one. HDR Bulldozer originally published byby pancakeman157. Click on pic, see it in Flickr. Don't move, pancakeman157! Hands up, and slowly step away from the HDR software. You really need to leave this HDR stuff to the professionals. Next time we see somethin' like this, ther'll be a ticket and a hefty fine. If anyone wants to rubberneck the carnage up close, here it is in large. 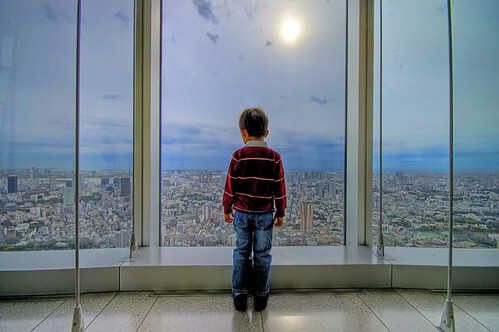 Window to His World, originally uploaded by /\ltus. Click on pic, see it in Flickr. This should be an award winner of some kind. But it's not all that interesting until to see it IN LARGE. Then the whole world of possibilities hits you, like it does this little boy. BTW, the city below is Tokyo. hdr backyard stillife 8, originally uploaded by Catbus. Click on pic, see it in Flickr. Let me make this perfectly clear...this is not an eBay photo. Oh, and ya gotta love the title. There is a reason to see it in large. I'm just not sure what it is. 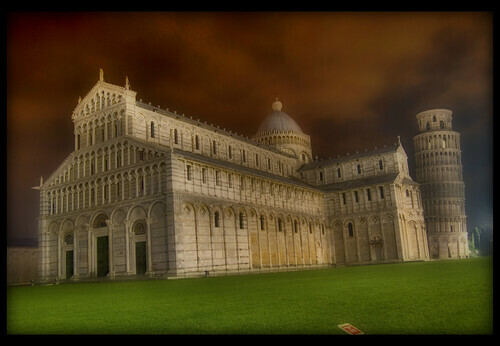 ☆ Piazza dei miracoli*, originally uploaded by marcovaleriof. Click on pic, see it in Flickr. At first glance, this does not even appear to be a photograph. HDR and tone mapping does an amazing job of bringing out the ideal exposure everywhere in the shot simultaneously. Without HDR this is a nothing shot. With HDR it becomes pretty amazing. From nothing to amazing...it's a miracle, uh, miricoli. Here's the miracle in large. The Horror, the horror ..., originally uploaded by totalisator. Click on pic, see it in Flickr. Imagine you go to a party and you complement the host on his landscaping, and then the host says..."yeah, check out the water garden out back." Then you go out and see THIS. I definitely would have a hard time dipping into the punch bowl after. 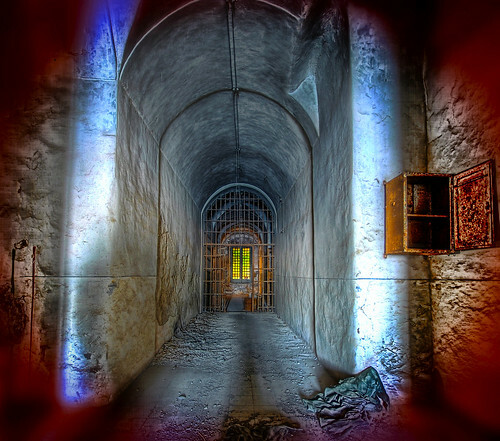 While there is nothing technically wrong with this Chiller selection (there were 389 shots that resulted from this search word and there were definitely pics with worse use of HDR than this), I picked this one because it just plain creeps me out! Totalisator references the similarity to Martin Sheen in Apocalypse Now...he might be right. wrooooom, originally uploaded by extranoise. Click on pic, see it in Flickr. 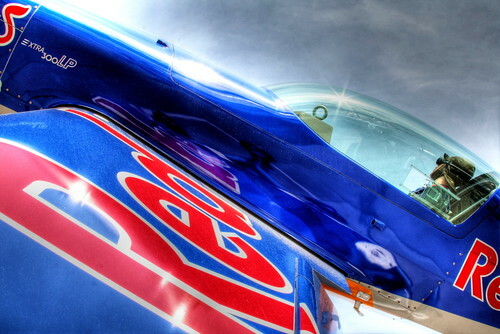 An imaginative shot and one that HDR processing really helps, because without it there would be no details inside the cockpit. The subtle contrasts in the sky are brought out too. As ususal, a good one to see IN LARGE. Camera Swing, originally uploaded by robbik. Click on pic, see it in Flickr. I wonder if this is candid or posed? Something tells me it doesn't really matter. Have a look at it in large to see that, yes, he is swinging what appears to be a DSLR or SLR. Not sure of the brand, but I'm thinking that my Olympus owners manual specifically says this voids the warranty. But I will tell you that the real reason I posted this shot is because I found it interesting that this same photographer took THIS ONE (!). Proving once again that anyone can do anything if you put your mind to it. The Old House On The Hill - HDR. Originally uploaded by David Giral -=ThePretender=- . Click on pic, see it in Flickr. You HAVE TO see this IN LARGE! Definitely a great shot that transports you to a another place and another time. 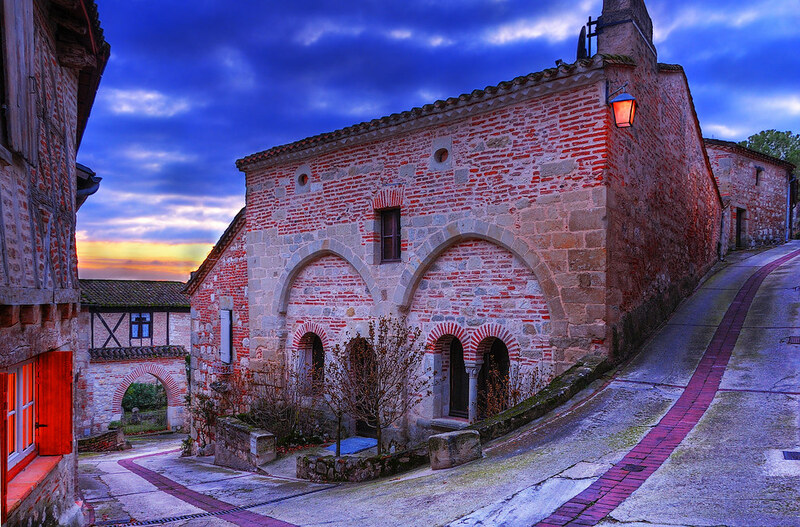 The composition is spot on, with accent elements between windows, sky, road, and especially the hanging lantern that are perfectly balanced in form and color. Officially, this is the second Thriller chosen from David Giral -=ThePretender=-. The other was another stunner from April 24, 2007. El Cactus, originally uploaded by Phil BF. Click on pic, see it in Flickr. Curious in many ways about this shot...aside from the HDR processing being very "off", why is this done in HDR to begin with?. And tilted? Oh, it just occured to me...maybe it's falling off the plant stand. If you really want to, you can see it fall IN LARGE. 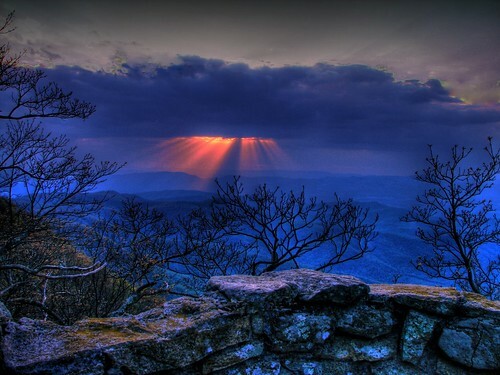 Thunder Ridge Overlook on the Blue Ridge Parkway, originally uploaded by LynchburgVirginia. Click on pic, see it in Flickr. My sister found out some horrible medical news today. There is no true salve right now, but Lynchburgvirginia seems to always comes through with meaning and tranquility when needed. This is a remarkable shot of "crepuscular rays", a term learned from two other interesting photoblogs, here and here. Though I believe this shot is photoshopped considerably in addition to the HDR processing, I ain't complainin'. It is lovely. Here it is in large. A Finishing Touch, originally uploaded by thepres6. Click on pic, see it in Flickr. Nice concept here. HDR shots often have that oil painting look, so why not capture this artist at work (and recapture his art). 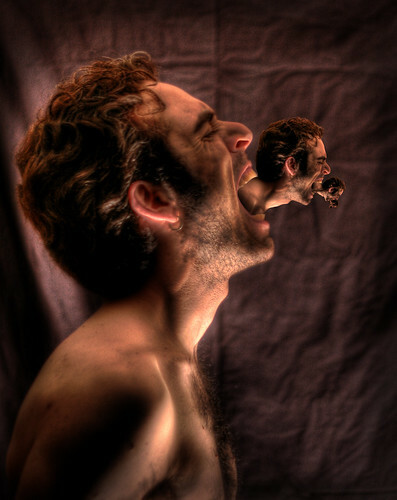 Definitely qualifies as surreal. It's fantastic in large. SMASH, originally uploaded by endraum. Click on pic see it in Flickr. "Smash"? LOL. Uh, I think I would put a shoe on first. And while I have enough time on my hands to blog this, at least I didn't have nearly enough time to set up and take the pic, process it, and post it. See it in large here (caution...if you do, you will dream of toenails tonight). P.S. - You looked didn't you...See what I mean ? 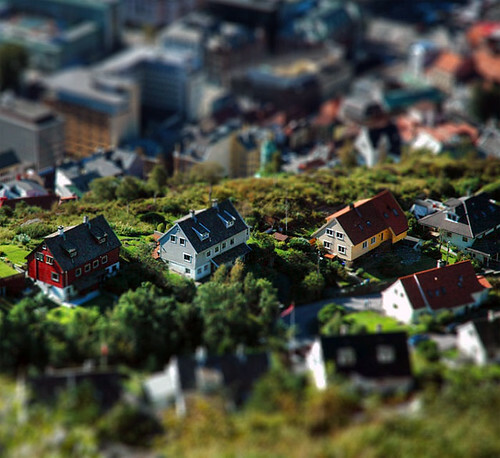 Bergen. Norway (HDR), originally uploaded by AlexEdg. Click on pic, see it in Flickr. The search word today comes from the weather around here which was very autumn-like this weekend, and continues today. Very windy and kinda cold. And its not like March because the leaves were on the trees making all this noise. This is a really neat pic that is processed with two techniques...HDR which enhances detail and optimal exposure and "Tilt-Shift", which leads to the interesting miniature effect. Very cool, like the weather. And as usual, it's even better in large. Saturated Autumn, originally uploaded by ~M. Click on pic, see it in Flickr. Ouch. Okay, I dare you....click on the link to the large size of this one and stare at it for a full half minute (without your Oakleys). Bet you can't do it without blinking or suffering a sunburn. Ready?...click here. Oh, and I discovered quite by accident that if you do this and then immediately close your eyes, you will see the tree in vivid blue. Kinda like what happens at your eye exam when the optomotrist shines that light beam on the back of your retina. 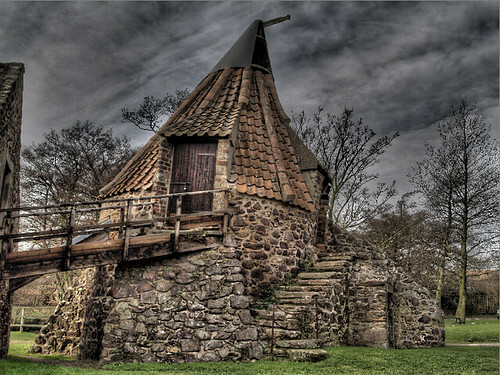 Preston Mill - Home for Hobbits,Goblins, Witches...!, originally uploaded by Longyester. Click on pic, see it in FLickr. Nice pic here, and an even nicer history (click on pic to see) of this mill in Scotland. If one were to be ultra-picky...yes, there is a tincture of halo in this shot, but given where its located and the sky context, it's not too noticable or distracting. Berlin New Hampshire, originally uploaded by americanadian_8. Click on pic, see it in Flickr. This photo clearly has multiple problems. Fence, HDR tree-halos, composition, and just that strange head-tilted feeling I get with a lot of Chiller selections of "Huh?" But I posted this one for another reason too...it's a fairly interesting study in Flickr comments in that they have sort of an "Emperor With No Clothes" thing going on. The first few comments are overwhelmingly positive(! ), and all the comments at the top follow suit. When somebody in the 13th comment finally mentions a flaw, then others chime in to chip away until the comments at the bottom are evenly split between critical and defensive. Coincidence?...or curious phenomenon? Oh, and here's my favorite comment... "I can only assume that the fence was inevitable??" That's deep. 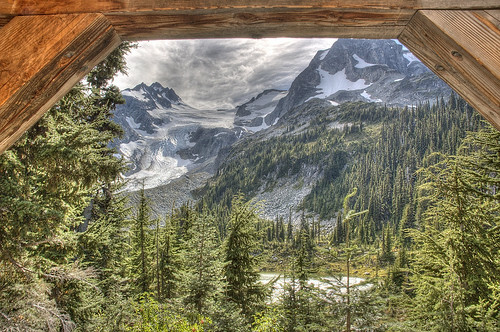 I looked even deeper though and found that americanadian_8 generally has some very good HDR shots...like this one. So he was evidently not on his game this day. We all have bad days, and I do find his username pretty cool. So speaking in my best Americanadian accent, let me just end this by saying "It happens, eh." Sorry, I couldn't resist that one....eh (maybe today is my bad day). See it in large if you want. 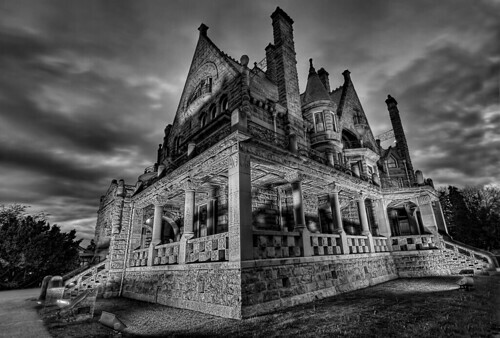 Craigdarroch Castle, originally uploaded by lightgazer. Click on pic, see it in Flickr. Very nice...well, eerie nice, anyway. For best effect, see it in large. Castle Hills, originally uploaded by •●pfaff. Click on pic, see it in Flickr. A real migraine inducer this one. And I am really not sure there could be another point to it. And if you make the mistake of seeing it in large you might actually need this. This is my favorite of all the temple shots., originally uploaded by Cap'n Surly. Click on pic, see it in Flickr. Pretty stunning shot here, but it REALLY REALLY must be seen IN LARGE. The best thing about good HDR shots are that you can palpably experience the place where they were taken. This one is an incredible example, even among the other Thriller photos. It depicts Ta Prohm, one of the ancient Angkor temples in Cambodia. Depending on the religion of the kings that constructed them throughout the historical Khmer period, these temples are alternately Hindu (Angkor Wat) or Buddhist (Ta Prohm). Either way, a mystical place for a westerner. Oh, and you might want to have a look at Cap'n Surly's other shots from Cambodia. A door to lost paradise, originally uploaded by alfaneque. Click on pic, see it in Flickr. 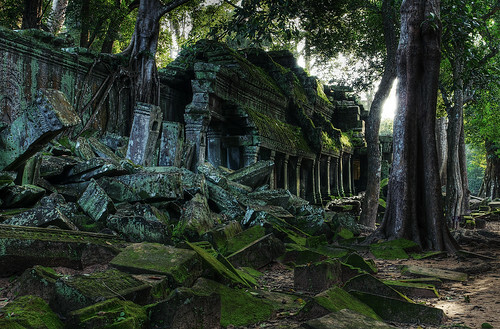 Looking at the 7th page of Flickr pics for this search word ("lost"), I found another pic of an Angkor temple. So a precedent has been set today as this Chiller is basically the same subject as today's Thriller. Through the 73 total posts, that has not happened before. It's all quite the coincidence, but not a big one because "lost" is probably a keyword many of us would commonly apply to Angkor temples...that's not a Buddhist or Hindu influence, but I would guess it's an outgrowth of a much more Western influence...Indiana Jones. This shot is an obvious Chiller selection. While the subject may be similar to Today's Thriller, the pic is totally overbaked (with halo, graying, and excessive purple fringing and saturation). A total turn off that, in my opinion, is HDR pushed to far. In large it's even more evident. Out Back. Originally uploaded by SOUTHEN. CLick on pic, see it in Flickr. Some search words yield great pics and others don't. 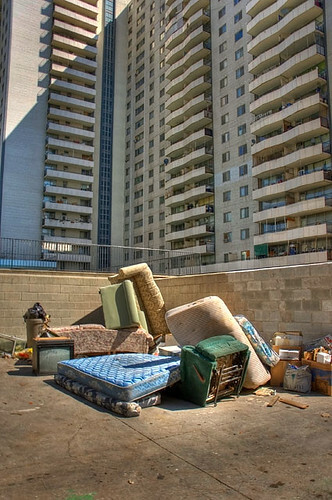 I was generally unimpressed with the pics that came out of this search word ("yard"), but this pic seemed the best of the lot. It could have used a light in the pool for color and effect, but it looks like a cool place to live or hangout. Here it is in large. Dump Yard., originally uploaded by mudkat. Click on pic, see it in Flickr. Here's something you don't see everyday. Thank goodness.